New ListingApple iPod nano 6th Generation Graphite (16 GB) W/ Accessories! Works GREAT! Apple iPod nano 6th Generation Graphite (16 GB) W/ Accessories! Tested. Works Great! Absolutely no issues. Shipped with USPS First Class Package. *Pictures of iPod working/playing in listing* Note: You will receive everything in the pictures. Note: Controller needs a new battery. 4.5 out of 5 stars - Apple iPod nano 6th Generation Graphite (16 GB) W/ Accessories! Works GREAT! 174 product ratings174 product ratings - Apple iPod nano 6th Generation Graphite (16 GB) W/ Accessories! Works GREAT! Apple iPod nano 6th Generation (Graphite/16GB), FACTORY SEALED (MC694LL/A). Condition is New. Shipped with USPS Priority Mail. Even though the box was opened, the iPod was never used.This generation of iPod nano was released in 2010 and discontinued in 2012. Apple iPod Nano Touch 6th Generation 16GB EMC NO. 2385 (A1366) Silver Color. Condition is Used. No scratches. Not sure how long battery lasts but has been unplugged and is still on after 24 hours. Shipped with USPS First Class Package. The Ipod is in great working condition. Apple iPod nano 6th Generation Graphite (16 GB). Condition is Used. Shipped with USPS First Class Package. Apple iPod nano 6th Generation Graphite/16GB SEALED (MC694LL/A) Collectors Item! Pictures are of exact item being shipped. The iPod is in original packaging never used or open. 16gb SELLING AS A COLLECTORS ITEM! NO RETURNS IF OPENED. Please be aware these were made over 7 years ago and since iPods are new and not tested I do not no battery life. But most likely need a new battery if intended to use. I am selling as a collectors item if you use you are responsible for battery if any charge issues occur. Thank you if you have any messages please message. FACTORY SEALED (MC694LL/A). Condition is New. Shipped with USPS First Class Package. 4.5 out of 5 stars - Apple iPod nano 6th Generation Graphite/16GB SEALED (MC694LL/A) Collectors Item! 174 product ratings174 product ratings - Apple iPod nano 6th Generation Graphite/16GB SEALED (MC694LL/A) Collectors Item! Apple Ipod Nano 6th Generation, 16GB, Blue. Condition is used and reset to factory settings. Comes with charging cord, original box, and device has a clip on the back. There is a very small surface scratch on the upper right corner of the screen. A great little starter iPod for kids or someone wanting a small portable music device. Please message me with any questions! Tap Genius with your finger and this iPod nano silver selects songs that go well together, to keep you in the groove of the music. When not in a mood for any particular music genre, just shake this Apple iPod and it shuffles to a new song. Great working condition iPod Nano 6th generation 16GB. Apple Ipod Nano 6th Generation, Silver (16GB) Great Deal!!! Apple iPod nano 6th Generation Green (16 GB) - GREAT CONDITION! FREE SHIPPING! Apple iPod nano 6th Generation Green (16 GB). Condition is Used. iPod Nano 6th gen with touch screen greenin color 16gb storage. iPod works great. Greatcondition overall. 5 out of 5 stars - Apple iPod nano 6th Generation Green (16 GB) - GREAT CONDITION! FREE SHIPPING! 33 product ratings33 product ratings - Apple iPod nano 6th Generation Green (16 GB) - GREAT CONDITION! FREE SHIPPING! Apple iPod nano 6th Generation 16GB Gray Color - Tested And Works! FREE SHIP! IPod Nano 6th gen with touch screen grayin color 16gb storage. iPod works great. iPod only, no cables! Apple iPod nano 6th Generation 16GB GrayColor! Condition is Used. MINT CONDITION / PERFECT / FLAWLESS - Apple iPod Nano 6th Generation Silver (16 GB). This device includes our 90. Apple ipod nano 6th gen Orange 16gb. Fully Functional. Apple iPod nano 6th Generation 16GB Blue Color - GREAT CONDITION! FREE SHIPPING! For sale is my ipod nano 6th generation 16gb in blue. 4.5 out of 5 stars - Apple iPod nano 6th Generation 16GB Blue Color - GREAT CONDITION! FREE SHIPPING! 46 product ratings46 product ratings - Apple iPod nano 6th Generation 16GB Blue Color - GREAT CONDITION! FREE SHIPPING! Apple iPod nano 6th Generation - 16 GB - Graphite (Grey) w/ all accessories!!! It is inexcellent condition and shows only minor signs of light use. I am the original owner and have taken good care of it. This - the 6th generation - is my favorite of the bunch as it is not much bigger than an iPod shuffle but has a wonderful full-color touch screen. 4.5 out of 5 stars - Apple iPod nano 6th Generation - 16 GB - Graphite (Grey) w/ all accessories!!! 145 product ratings145 product ratings - Apple iPod nano 6th Generation - 16 GB - Graphite (Grey) w/ all accessories!!! Apple iPod nano 6th Generation Silver (16 GB). Condition is Used. Shipped with USPS First Class Package. 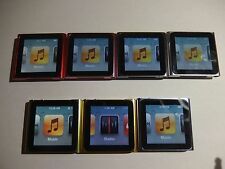 Lot of 2 Apple Ipod Nano’s, 8GB and 6th Generation. Fully Operational. Lot of 2 Apple Ipod Nano’s. Both are 8gb and 6th Generation. Condition is Used with normal wear and tear and some light scratches on the screen but fully functional. One of the ipods has a very small hairline crack on the screen (see pic) This doesn’t. effect performance or obstruct the screen in any way. Included is a wrist watch style running strap which fits around the iPod, works great for activity. Shipped promptly with USPS First Class Package. Trending at $84.65eBay determines this price through a machine learned model of the product's sale prices within the last 90 days. IPod Nano 6th gen with touch screen blue in color 16gb storage. iPod works great. Great condition overall. iPod only, no cables ! Apple iPod nano 6th Generation 16GB BlueColor - GREAT CONDITION! Condition is Used. IPod Classic. iPod Touch. iPod Shuffle. iPod Accessories. iPod Parts. Product has had an OEM master reset and flash. We can best describe this grade as “well used but in fully working order”. Product has been through a thorough screening process by our engineers and is graded as C standard. This device is in good condition and fully functional. IPod Classic. iPod Touch. iPod Shuffle. iPod Accessories. iPod Parts. Product has had an OEM master reset and flash. We can best describe this grade as “used but in good condition and fully working order”. Subcategory: Nano. Generation: 6th. Storage: 16 GB. These iPods are used and are in fair condition. They have been cleared and tested and is fully operational and functions as intended. Because it is used, there will be noticeable wear throughout the iPods along with sticker residue. Device is in VERY GOOD used cosmetic condition with small scratches and wear. Color is Pink. Device is in 100% WORKING condition. It has been extensively tested and found to be fully functional. Apple limited warranty expired. 8GB. Apple iPod nano 6th Generation Graphite (16 GB) W/ Accessories! Works GREAT!